Gonstead represents the ultimate standard in “hands on” spinal adjusting and remains the leader in chiropractic techniques. Adhering to the definition of true chiropractic as defined by D. D. Palmer, the founder of Chiropractic in 1895, Dr. Gonstead found there was no substitute or better method for analyzing or correcting spinal misalignments than with a skilled pair of chiropractic hands. This remains to be true today. Dr. Clarence S. Gonstead (1898-1978) began practicing chiropractic in 1923 in Mt. Horeb, Wisconsin, a small farming community of 1,200 residents in south central Wisconsin. 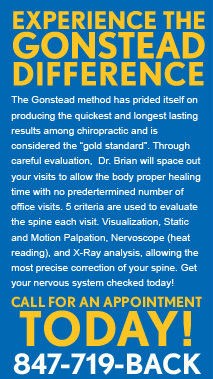 Dr. Gonstead’s reputation spread throughout the state, the country and ultimately around the world, as a multitude of patient’s health problems were corrected remarkably fast by his brand of chiropractic care. Hundreds of patients were seeking his care on a daily basis, and with his dedication to helping these patients, Dr. Gonstead worked from 8 a.m. to midnight six days a week plus every Sunday morning from 5 to 10 a.m. to be able to accommodate these growing patient numbers. When Dr. Gonstead’s schedule was at the limit of his physical capability, he knew the only solution to meet the public’s health needs on the scale the public was demanding, was to build an unparalleled chiropractic treatment facility and staff it with Gonstead trained associates. The Gonstead Clinic of Chiropractic, completed in 1964, was the third and final clinic Dr. Gonstead would design and treat patients from in this little town of Mt. Horeb before his death in 1978. Dr. Gonstead built the largest chiropractic facility in the world. A 22,000 square foot clinic, it had a waiting room to seat over 100 patients, 11 adjusting rooms, x-ray facilities and lab, and a lower level to hold Chiropractic seminars. It was to become the most renowned chiropractic facility in the world. Next to his new clinic, Dr. Gonstead added a 78 room, full-service motel to accommodate the clinic’s numerous long distance patients. Dr. Gonstead and his fellow staff members served 300 to 400 patients on a daily basis. This huge following of patients led Dr. Gonstead to start the Gonstead Seminar of Chiropractic, helping to teach and develop even more Chiropractors in the art and philosophy of the Gonstead system of chiropractic treatment. The Gonstead practitioner is well educated in the teachings and application of this tremendously successful technique and case management system. Beyond the eight years of chiropractic and college education required to become a Chiropractor, followed by national and state board licensing requirements to be a practicing Chiropractor, the Gonstead practitioner has spent additional time attending Gonstead Seminars to help perfect their application of chiropractic within the Gonstead System. Dr. Vanderbilt has attended over 20 Gonstead seminars to better serve his patients.